This book review was published at “www.boloji.com”. 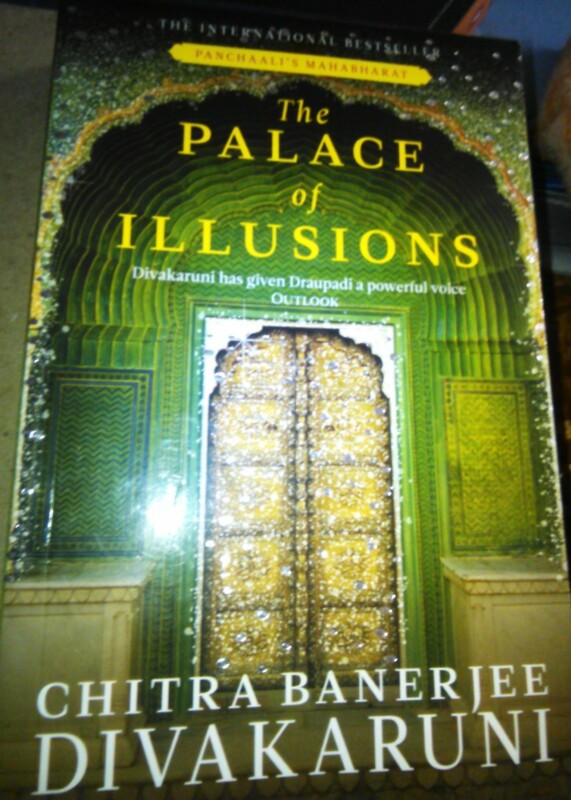 Set in the Dvapar Yug or the Third Age of Man (between 6000 BCE and 5000 BCE ), the Palace of Illusions is Chitra Banerjee’s first foray into the ancient past, where she retells the Mahabharata through the powerful voice of Draupadi. The wife of the five Pandavas, and daughter of King Drupad, she has often been referred to as the main reason for the Great War that destroyed the third age of man. Through her book, Banerjee brings to light Draupadi’s life, her voice, her questions and her vision. The unique feminine way in which Draupadi viewed the world and her place in it are unfurled through conversations, stories and dreams. Beginning with the birth of Draupadi, and her lonely childhood years, where her brother was her only companion, to the bond she shared with Krishna, and her marriage to the Pandavas, the author shows an era when men and gods co-existed. At the heart of the story, is, of course, the fierce rivalry between the Kauravas and the Pandavas, along with their constant struggle for the throne of Hastinapur. Often, while Banerjee listened to the stories of Mahabharata, she felt that the portrayals of women were unsatisfactory. They came to the forefront only when they affected the lives of the male heroes. Hence, through this book, she had tried to keep a woman in the forefront of action. Born to change the course of history, Draupadi, like every young girl, wondered whom she would marry. Would she be the mistress of her own home? Would she find love? However, unlike other girls who gossiped, chewed betel leaves to redden their lips, pouted and giggled, she was keen on preparing herself for the destiny that awaited her. Her hunger to know the world that existed beyond her imagination and her place in history was much more. Further, her pride, impulsiveness, temper and vengefulness speeded her destiny. Hence, when the moment arrived, she couldn’t control the ill-chosen words that came out of her and humiliated Karna. Thus, the wistful beginning of love between her and Karna came to an end forever. Later, some gave her regard for putting the son of a chariot driver in his place and some criticized her for her razor-sharp tongue. But none realized her dilemma of being torn between her love for her brother and the man she desired. Although she tried to redeem herself on many occasions, Karna didn’t let her. A part of her died when she was gambled away by her husband and everyone she counted on to save her, watched her being shamed. Moreover, the person who instigated Dussasan for the heinous act was someone she could never imagine. That day, she was transformed from a young, naive girl to a woman with vengeance as her sole motive. That day, she realized something about the Pandavas. “But now I saw that though they did love me – as much as perhaps as any man can love – there were other things they loved more. Their notions of honor, of loyalty toward each other, of reputation were more important to them than my suffering. They would avenge me later; yes, but only when they felt the circumstances would bring them heroic fame,” Draupadi is quoted in the book as saying. In a very simple and lucid way, the author gives a keen insight into the Indian patriarchal system and superstitious beliefs in the society. Some of these beliefs are: a kashtriya woman’s purpose is to support the men in her life (her father, brother or husband), one could call up a man’s death simply by speaking of it, and many more. The reader witnesses the three phases of Draupadi’s life. In the first phase, she is a naive bride who desires adventure, love, queenship and a palace of her own. In the second, she is on foot, clad in a servant’s attire, her husband had lost everything at the dice and vengeance is all that she wants. In the third phase, she desires nothing and has chosen to renounce the worldly life, though it is hard for her to do so. Banerjee also draws our attention to flaws of some prominent characters in Mahabharata. For eg, Bheeshma thought so deeply of the laws of men that it paralyzed him. In the moments when Draupadi needed him, he wasn’t sure whether she was already Duryodhan’s property. In that case, he had no right to intervene. To Yudhisthir, rules were always more important than human pain or love and Arjun had a warrior’s ego. The characters, though heroic, have flaws, which give the story a human touch. Through the game of storytelling between Draupadi and her brother, Banerjee cleverly builds up the character of Drona, and unfurls the friendship and the reason for vengeance between Draupadi and Drona. She also brings to light another hero of Mahabharata, who faced misfortunes his entire life — Karna. There are various anecdotes within anecdotes in the novel, giving a glimpse into Indian mythology. Marked with clarity, simplicity and elegance, Banerjee makes one wonder whether it is right to blame Draupadi for the Great War. Despite all the flaws that she had, was the shame that was hurled on her correct? Didn’t she also suffer the pain of losing her family and loved ones like others? And is it right to call her a Kritya (someone who is jinxed and brings doom to family)? Overall, Banerjee has done a commendable job weaving the epic Mahabharta in 360 pages.